We had an interesting event happen on one of our lab servers this weekend. One of the hosts in our four node cluster hit an issue, which meant that the storage on that host was no longer available to the VSAN datastore. 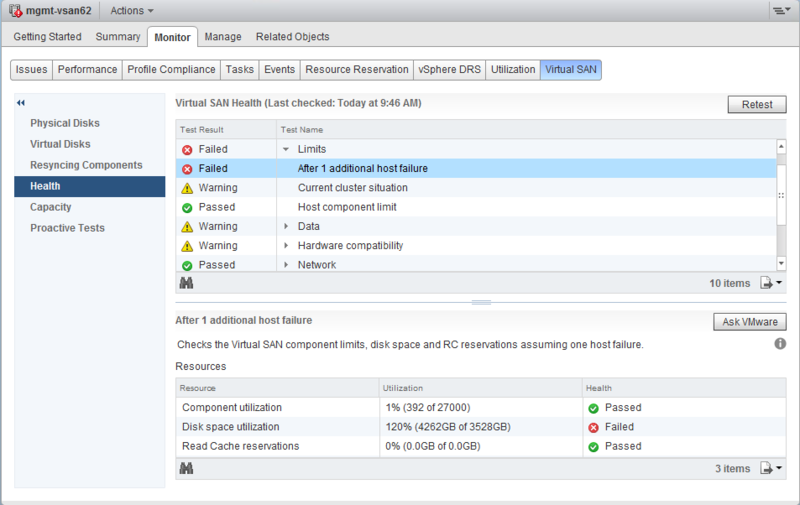 Since VSAN auto-heals, it attempted to re-protect as many VMs as possible. However, since we chose to ignore one of the health check warnings to do with limits, we ended up with a full VSAN datastore. 2016-04-17T09:50:25.278Z| vcpu-0| I120: Tools: Tools heartbeat timeout. and clicking Retry. Click Cancel to terminate this session. The next step is to respond to the message. Note that the message id is 6034178. Looks good. Let’s see if the message is still there. If it is, as shown below, you will have to run the same command again, but with the new message id. Note that you may have to repeat it a number of times. clicking Retry. Click Cancel to terminate this session. So finally the message has cleared. The next step is to bring up vCenter using the same method. Once your vCenter server is up and running, you can connect to it with the client, and answer any other outstanding questions associated with your VMs. Hi Cormac. Nice write up as always. Would it be possible to clear messages and start VMs with ESXi Embedded Host Client? I hope so. When you said, “Anyway, to cut a long story short, we fixed the original problem, and the space issue got resolved.” does this mean you added more storage for now? I think I had something similar happen but after deleting all my VMs (lab for now) I can’t free up any space. The datastore is empty but it still says uses is 4.4TB out of 5TB. No, we fixed the issue on the problematic host, and its storage became available for use once more. I remember a refresh issue with the VSAN datastore views. Can you check it out in the datastores view, and refresh it there, to see it that triggers the UI to update.